Some of you may have heard of bitcoin; others, perhaps not. Bitcoin is not a coin you collect in Super Mario Brothers; it is a “cryptocurrency” that has caught this year’s headlines—and it has more than doubled in price. As more people ask about bitcoin and the viability of investment, we wanted to educate our members and share our thoughts on what bitcoin is and to identify some of the hurdles bitcoin and other cryptocurrencies face. So, what, exactly, is bitcoin? Bitcoin is a peer-to-peer cryptocurrency, or digital asset, designed to work as a medium of exchange using cryptography to secure the transactions. These virtual tokens represent an entry on a digital ledger, similar to how a bank records money on its ledger. Banks, however, track and maintain records in centralized databases that are subject to the rules and regulations of each institution’s governing body. Your personal information is stored in these centralized databases and is, therefore, vulnerable to identity theft. The appeal of bitcoin is there is no centralized authority. Because bitcoin transactions use a decentralized ledger system, bitcoins can move freely between users without regulatory intervention, and in a secure and discreet manner collectively across the network. Instead of your private information being kept on a central system, a decentralized ledger allows the encrypted information to be public and stored on your personal computer or on cloud-based storage devices. No one owns or controls the network. The way your information is protected is based on the cryptography or “digital signature.” All cryptocurrency transactions take place using a digital signature, a constantly-changing encrypted identifier specific to the user. No personal information is stored in the public database, making it difficult to hack or to identify a specific user. A concern with bitcoin is that no central bank or governmental authority backs the safety or reliability of digital currencies. 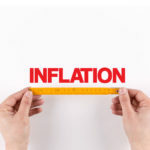 It is the wild west when compared to fiat currencies like the U.S. dollar, which is printed by the Federal Reserve. 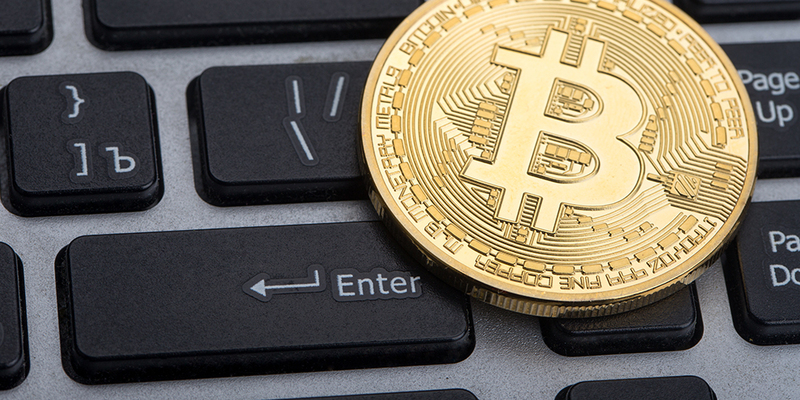 Bitcoins are minted by complex interactions across a global computer network through “mining.” Bitcoin mining is the practice of computers processing transactions for the network by adding them to the ”blockchain”—the public ledger of every bitcoin transaction since the inception of the network. (For more information on this topic, please see our article on blockchain here). Miners are rewarded with bitcoin for every block of transactions processed. Inherently, circulation is capped at 21 million bitcoins and, as more computers come online to “mine,” the more difficult the computations become, thus slowing down bitcoin creation. As uncertainty in the global financial system rises, cryptocurrencies such as bitcoin will garner more attention. The inherently limited supply of bitcoin, coupled with increasing demand, inevitably also has increased the bitcoin price. Much of the demand originates oversea – in April 2017, Japan officially recognized bitcoin as a payment method. 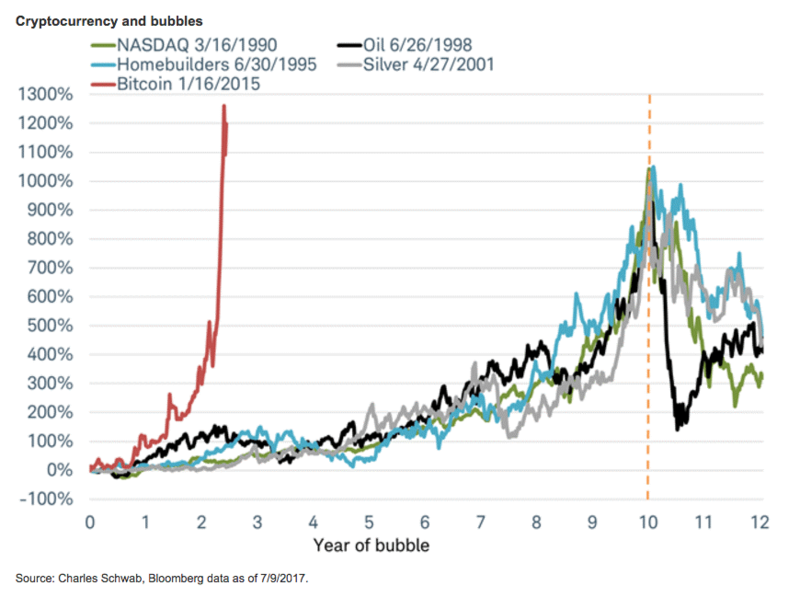 The recent and unprecedented price movements have investors wondering if we are in the midst of a bitcoin “bubble.” Shown below is a chart from Charles Schwab that illustrates the level and speed of bitcoin price appreciation relative to other historical bubbles. Bubbles typically take 10 years to inflate to around 1,000% before bursting. Essentially, the longer the rise, the more embedded and damaging a burst (if it occurs) is to the economy and financial markets. There is some debate, however, about whether bubbles form more quickly today than what are historical norms, which is what has us concerned when evaluating bitcoin as a viable investment. The one silver lining: the rapid price increase evidences bitcoin’s growing popularity, and an apparent desire for it to go mainstream. Just as PayPal, Venmo, and other payment processing systems gained traction because of the failure of “traditional” payment methods to meet users’ needs, bitcoin has the potential to radically change the payment method and currency games. Its open architecture could be even more disruptive, upending existing familiar and deeply entrenched monetary concepts. In addition, we believe there could be a significant market for bitcoin-based services that more effectively or affordably perform than conventional banking services. But before bitcoin can become a mainstream alternative currency, it must overcome many hurdles. Blockchain complexity is a source for investor skepticism, and many people do not comprehend the value of such technology. Bitcoin exchanges must also significantly improve security surrounding transactions in order to strengthen confidence in the system. Despite advances in security, exchanges have a checkered past of hacking attacks and theft. Although we believe there are a lot of opportunities for bitcoin to complement conventional financial networks and global banking, such attacks weaken confidence in its sustainability and inhibit its movement to replace traditional currencies. Bitcoin also is not (yet) currently a practical form of payment and it is not widely accepted. The slow pace of its integration could be the result of uncertain regulatory status—traditional currencies are regulated by national governments or major financial institutions. Until businesses begin to accept bitcoin, traditional payment methods such as cash and credit cards will remain the standard. Although a slow transition has begun, there still is a long way to go. The bitcoin market is very dynamic. Rapid advances in digital technology are transforming the financial services landscape and the currency is extremely volatile. We are in the midst of a gold-rush mentality on an asset whose value is based on perception alone and which operates in an unregulated environment. Only time will tell if bitcoin will be known as a worthless experiment or as the greatest disruption to the financial industry we have ever seen. The implications are undeniable, but that does not mean that they are inevitable. Bitcoin and other cryptocurrencies will continue to create opportunities and challenges for everyone—from users to service providers to regulators—as it continues to challenge conventional banking practices. A “cryptocurrency” is a digital currency that uses encryption technology to regulate the number of units that may be generated and to transfer funds; a cryptocurrency typically is outside the realm of “traditional” banking.